President Barak Obama has named Associate Professor Derek Paley (AE/ISR) as a recipient of the Presidential Early Career Award for Scientists and Engineers (PECASE). He is one of only 102 researchers nationwide this year to win the highest honor bestowed by the federal government on science and engineering professionals in the early stages of their independent research careers. The $1M, five-year grant will support Paley's project, "Bio-Inspired Propulsion, Sensing and Control for a Novel Underwater Vehicle." Paley, whose PECASE nomination was sponsored by the Department of Defense, is the founding director of the Collective Dynamics and Control Laboratory and a member of the Alfred Gessow Rotorcraft Center, the Maryland Robotics Center, the Program in Neuroscience and Cognitive Science, and the Applied Mathematics and Statistics, and Scientific Computation Program. 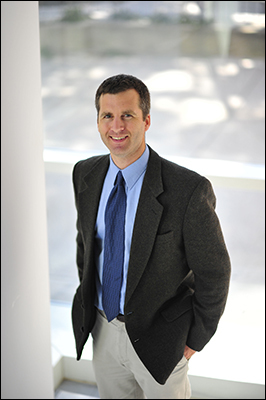 He received the NSF CAREER Award in 2010 for dynamics and control of motion coordination for information transmission in groups. A textbook he co-authored, Engineering Dynamics: A Comprehensive Introduction is in use at top engineering schools. Paley's research interests are in the area of dynamics and control, including cooperative control of autonomous vehicles, adaptive sampling with mobile networks, and spatial modeling of biological groups. His research is based on support by the U.S. Army, the Office of Naval Research, and the National Science Foundation. Paley is an Associate Fellow of AIAA and a Senior Member of IEEE. Paley received the B.S. degree in Applied Physics from Yale University in 1997 and the Ph.D. degree in Mechanical and Aerospace Engineering from Princeton University in 2007. Paley is joined by another ISR faculty member, Assistant Professor Sarah Bergbreiter (ME/ISR), in winning the PECASE award this year. Both Paley and Bergbreiter are associated with the Maryland Robotics Center. They will receive their awards in a White House ceremony in 2014. Below, Dr. Paley explains his research focus in an ISR video. View more videos of his work on the Maryland Robotics Center's YouTube channel.